There are actually entire courses on the subject of retail math (and you can take a short one for free online). But what I find most fascinating is the mix of psychology and mathematics that goes into setting prices. Many special offers take advantage of the fact that most of us aren’t very good at calculating discounts, with the exception of 10% and 50% off. If the sign says 40% off, our mind is likely to round it up to 50% just to make it easier. This is one reason that our post-holiday sales are at 40% off instead of 50%. The shorter discount allows us to recapture our cost of merchandise including freight charges, and we rarely hear customers complain that we’re not discounting the goods by 50% like most stores. 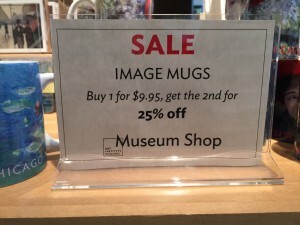 Other promotions, such as this special on mugs at the Chicago Art Institute Museum Shop, move more inventory by offering a special only if two or more items are purchased. If the offer had read Mugs – 12.5% Off, it would not have been particularly enticing. But offering 25% off the second mug is in essence the same thing. Similarly, you can use the word “free” — arguably the most powerful term in retail advertising — to sell merchandise at half price simply by saying Buy One, Get One Free. Instead of selling one item at 50% off, you’ve sold two. Another interesting aspect of retail math is the use of 95¢ instead of the round dollar. You would think that customers would not fall for small but common perception, and yet I hear shoppers say to each other “Look, it’s only $8.00!” when an item is tagged $8.95. In an article on pricing in the Consumers’ Choice Award blog, Manoj Thomas and Vicki Morwitz are quoted as mentioning that this is due to the fact that consumers read prices from left to right, and the number on the left makes the greater impression. The article also mentions that we are accustomed to sale pricing, and the use of .99 or .95 indicates that an item has been marked down. Perhaps the best name for the study of pricing would be Retail Math and Consumer Psychology. Setting prices and offering sales may not have the transparency we would want, but it’s probably a good idea to play the game the same way as the majority of successful stores.